Elephant Dung Coffee, The coffee beans are extracted from the dung of elephants who have been feed the coffee berries. Research indicates that during digestion, the enzymes of the elephant break down coffee protein. Since protein is one of the main factors responsible for bitterness in coffee, less protein means almost no bitterness. One cup of coffee costs $50. Kopi Luwak, or civet coffee refers to the beans of coffee berries eaten and excreted by the Asian Palm Civet. The civet eats the berries for their fleshy pulp. In the digestive tract, the civet's proteolytic enzymes seep into the beans, making shorter peptides and more free amino acids. Passing through a civet's intestines the beans are then defecated, keeping their shape. 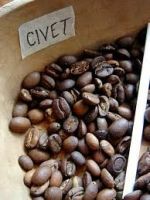 This method has been critisized because the civet is force fed the coffee beans, isolation, poor diet, small cages and a high mortality rate. Jamaican Blue Mountain Coffee, is noted for its mild flavour and lack of bitterness. 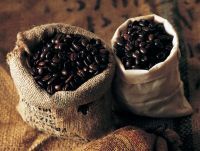 Over the last several decades, this coffee has developed a reputation that has made it one of the most expensive and sought-after coffees in the world; over 80% of all Jamaican Blue Mountain Coffee is exported to Japan. In addition to its use for brewed coffee, the beans are the flavor base of Tia Maria coffee liqueur. La Esmeralda, is well known as the 'Esmeralda Special'. The coffee beans are produced at the farm Esmeralda Jaramillo in the mountains of West Panama. It's intense and strong taste is the result of the cold climate and the careful harvesting of the bean. 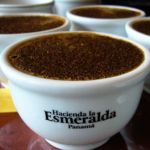 La Esmeralda's Gesha variety coffee first appeared in 2004 when it won first place in the Best of Panama Competition, taking the international jury by storm. Gesha, an Arabica coffee variety exported from the wild forests of Ethiopia in 1931, was introduced into Central America in the 1950's. 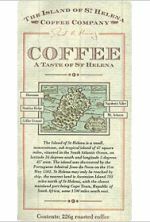 St. Helena Coffee, This coffee is the product of the small island of Saint Helena. The coffee is made from the 'Green Tipped Bourbon Arabica', a bean that is exclusive to this island. The taste is pleasant and fruity. St Helena Green Tipped Bourbon is wet processed to the highest possible standards, with a wonderful semi translucent sheen in green bean form. This delicate bean, medium roasted has a high lively acidity, with good balance and good body. This coffee has a superb fragrant bouquet with no off flavors and pleasant floral fruity hints of citrus and caramel strongly hinting of its Yemeni. Espresso: is always capped by a 5 mm hazel 'crema' and should be syrupy enough to maintain one teaspoon of white sugar on its surface for 3-4 seconds before it falls through. Macchiato: is an espresso with a dash of milk or froth added to it to soften the flavour. A macchiato can be served in a glass or in an espresso cup and is available as a single or double shot. Long black: is a cup full of rich-bodied black coffee, made by topping up a single or double shot of espresso coffee with ⅔ cup of hot water. Cappuccino: is an espresso topped up with steamed milk, a good dollop of froth and a dusting of chocolate powder, renders this coffee drink very palatable and tasty. Caffé latte: is an espresso shot with steamed milk added. When poured correctly there should be a 1cm head of foam on the top of the latte. Unlike a cappuccino, it should be served in a glass with no chocolate on top. Flat white: Made simply by topping up an espresso with steamed milk, ensuring just the milk is added, instead of the foam. It is the drink of choice for those who enjoy the strength of a cappuccino, but not the foam that goes with it.